Norman Kerry around 1929 in a publicity photograph. 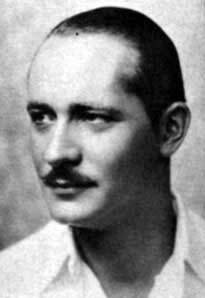 Norman Kerry (born Norman Hussey Kaiser, June 16, 1894 – January 12, 1956) was an American actor whose career in the motion picture industry spanned twenty-five years beginning in 1916 and peaking during the silent era of the 1920s. Changing his name from the unmistakably German "Kaiser" at the onset of World War I, he rose quickly in his field, becoming "the Clark Gable of the [1920s]." He often played the heroic dashing swashbuckler or the seductive lothario and was extremely popular with female fans. On a personal level, Kerry was known as a prankster and was said to have a wonderful sense of humor and to be very popular. He also achieved some recognition as a dog fancier, maintaining kennels at his home that were "known throughout the world among lovers of aristocratic dogs." As his film career waned in the 1930s, he became known as an international bon vivant and adventurer who lived in the French Riviera and even joined the French Foreign Legion. Kerry made his first film appearance in the 1916 comedy Manhattan Madness, starring Douglas Fairbanks and directed by Allan Dwan. Dwan needed young people with horses to appear in a scene and Kerry volunteered himself and his friends to fill that need. The following year, Kerry rose to leading actor status in A Little Princess, playing opposite actress Mary Pickford. He again appeared with Mary Pickford in 1918, in "Amarilly of Clothes-line Alley", and that in turn led to his being chosen by Constance Talmadge as her leading man in Up the Road with Sallie. He was "on his way!" Kerry's career flourished from the time of those early successes and throughout the 1920s--the silent film era. In 1920, he was paid a salary of $750 per week and by 1930 he had been under contract with Universal Pictures for twelve years and was thought to be among the actors who had played the most roles in his career. He wore a fancy waxed mustache and slicked-back hair, exemplifying the "tall, dark, and handsome" matinee idol of the time. In 1923, he starred in two of his most popular films, the enormous box-office success The Hunchback of Notre Dame, with Lon Chaney and Patsy Ruth Miller and the controversial Merry-Go-Round, opposite Mary Philbin. 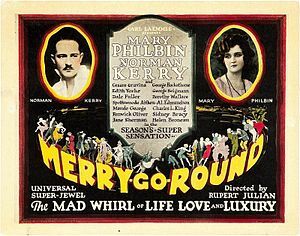 In Merry-Go-Round, Austrian director Erich von Stroheim chose Kerry to play von Stroheim's alter-ego 'Count Franz Maximilian Von Hohenegg', but producer Irving Thalberg replaced von Stroheim with director Rupert Julian during filming. The film is now considered a classic. Kerry was again cast with Lon Chaney and Mary Philbin in the 1925 horror classic The Phantom of the Opera, playing Philbin's love-interest, the Vicomte Raoul de Chagny. The film was an enormous financial and critical success and solidified Kerry's position as a leading actor during the 1920s. That same year Kerry starred with Philbin in the melodrama Fifth Avenue Models and with Patsy Ruth Miller in the adventure film Lorraine of the Lions. In 1927, Kerry again shared the screen with Lon Chaney in The Unknown, also starring Joan Crawford. By the end of the decade, he had appeared in high-profile roles opposite such famous actresses of the era as: Anna Q. Nilsson, Marion Davies, Bebe Daniels, Mildred Harris, Lillian Gish, and Claire Windsor. At the beginning of the talkie era, Kerry reunited with Mary Philbin to film talking scenes for The Phantom of the Opera, reissued with sound 15 Dec 1929. However, this was the beginning of Kerry's decline; he made only a few American films after 1930. Among them were Air Eagles and Bachelor Apartment in 1931 and Kerry's final film, Tanks a Million, in 1941. During the 1930s, Kerry also made some movies for British, German, and Italian producers. For his contributions to the motion picture industry, in 1960 Kerry was awarded a star on the Hollywood Walk of Fame at 6724 Hollywood Blvd., Hollywood, California. Born in Rochester, New York on June 16, 1894, Kerry was the son of Isaac and Eunice Kaiser. As he was growing up, he lived with his family in New York City and Long Island. He was a student at the DeLaSalle School, St. John's College, and the University of Maryland, where he was an athlete. Kerry's father, Isaac Kaiser, was a leather goods manufacturer and dealer and Kerry himself spent some time as a representative for that company. Around 1916, Kerry befriended Rudolph Valentino, who was then known as an exhibition dancer, in New York City. He is said to have introduced Valentino to Bonnie Glass, who became Valentino's dance partner. Later, Kerry encouraged Valentino to try making a name for himself in film, staked him for a trip to Los Angeles, and helped him get his first roles. In 1917, despite having already achieved some success in the motion picture industry, Kerry enlisted in the British Royal Flying Corps and was to report for training in Toronto, Canada in September of that year, with a commission as a lieutenant. However, on November 2, Kerry's father died, leading to his being granted six months leave. In 1918, he served briefly (October 2 to December 4) in the U.S. Army, returning to Los Angeles and his film career by the end of that year. Kerry had been living in a Los Angeles hotel in June 1917 but by the end of the year, he took up residence in a bungalow in Hollywood, where he was joined by his mother and sister. They moved to a house at the entrance to Laurel Canyon the following June. Kerry was still living with his mother and sister as of January 1920. About six weeks later, Kerry was married for the first time. His bride was a 22-year-old divorcee, Rozene (Tripp) Greppin, said to be an heiress. The marriage did not last. The couple separated on November 11, 1928 and Rozene filed for divorce the following April, charging that Kerry called her vile names in front of others, stayed away for extended periods, and ignored her; the divorce was granted on June 7, 1929. About two weeks after the divorce was granted, Kerry made a very public effort to win Rozene back. On June 20, 1929, she was scheduled to board the ocean liner Majestic in New York, bound for England. After learning that she was there, Kerry attempted to board the ship, seeking a reconciliation. Having neither ticket nor passport, Kerry was not allowed on board. Nevertheless, he then scaled a fence around the baggage area, evaded crew members who tried to stop him, and entered the ship on an escalator used to load baggage. Once in England, he was required to put up a passport bond and remained there for about two days. His efforts to save the marriage were unsuccessful. Kerry's second wife was Helen Mary (Yost) Wells, ex-wife of a New York grain broker. They were married in New York on November 2, 1932. The couple said that they had been friends since before their previous marriages; he was 38 and she gave her age as 32. Just over two months later, they separated and Helen moved out of their home and into a hotel. There followed a reconciliation, but the following year Helen filed for divorce, alleging that Kerry drank heavily. The divorce was granted on September 17, 1934. This divorce was not the end of Kerry's relationship with Helen. Though there were rumors of a reconciliation with first wife Rozene, Kerry later followed Helen to Vienna, Austria, and the two eventually remarried there. Kerry had often been living and working in Europe since the beginning of their marriage. He lived in Brussels for a time and by 1940 he and Helen were living in the French Riviera, near Nice. Kerry's life then took a surprising turn: in January 1940, he enlisted in the French Foreign Legion. He explained to Helen, who ultimately acquiesced in his decision, that he owed it to the French, whose hospitality he had been enjoying, and that he had been dissatisfied with the shallowness of his life as an actor; he wanted to have "real experiences, not just make-believe." In the Legion, he saw service in Luxemburg and Morocco, but his tour of duty lasted less than a year because of the fall of France to Nazi Germany. In January 1941, Kerry returned to California. The following year brought news that Kerry had become engaged to actress Kay English, though their marriage would have to wait until there was a final divorce decree between Kerry and Helen. Kerry and English did eventually marry, in 1946, and they remained married until his death in 1956. At the age of 61, on 12 Jan 1956, Norman Kerry died from a liver ailment at Cedars of Lebanon Hospital in Los Angeles, California. He was interred at Holy Cross Cemetery, Culver City, Los Angeles County, California. ^ a b "United States World War II Draft Registration Cards," registration for Norman Hussey Kaiser, Los Angeles, California, April 27, 1942. This document lists his full name as Norman Hussey Kaiser, noting the name Norman Kerry as an alias. ^ a b Democrat and Chronicle (Rochester, New York), 14 Jan 1956, page 7. ^ a b c d "Norman Kerry, Idol of Silent Pictures, Dies," Los Angeles Times (Los Angeles, California), 13 Jan 1956, page 5. ^ "NORMAN KERRY, AN EX-FILM STAR: Romantic Hero of the Silent Screen Dies--Figured in Real-Life Escapades, Wore Waxed Mustache," New York Times (New York, New York), 13 Jan 1956, page 23. ^ San Francisco Examiner (San Francisco, California), 14 Oct 1953, page 10. ^ a b c d e f g h i j k "Norman Kerry," at the official website of the Hollywood Walk of Fame (accessed 20 Feb 2019). ^ a b c d e f g h i j Norman Kerry at GoldenSilents.com (accessed 20 Feb 2019). ^ San Francisco Examiner (San Francisco, California, United States of America), 21 Jul 1934, page 7. ^ a b Rambova, Natacha. Rudy. London: Hutchinson & Co., 1926. Page 15. ^ Ottawa Citizen (Ottawa, Ontario, Canada), 11 Feb 1928, page 22. ^ Ottawa Citizen (Ottawa, Ontario, Canada), 6 Mar 1920, page 13. ^ Star Tribune (Minneapolis, Minnesota, USA), 19 May 1918, page 26. ^ Wichita Daily Eagle (Wichita, Kansas), 5 Sep 1920, page 27. ^ Los Angeles Times (Los Angeles, California), 9 Nov 1930, page 36. ^ "Merry-Go-Round," at AFI Catalog of Feature Films. ^ The Phantom of the Opera at AFI Catalog of Feature Films. ^ Fifth Avenue Models, at AFI Catalog of Feature Films. ^ Lorraine of the Lions at AFI Catalog of Feature Films. ^ The Unknown, at AFI Catalog of Feature Films. ^ Three Live Ghosts, at AFI Catalog of Feature Films. ^ The Man from Home, at AFI Catalog of Feature Films. ^ Between Friends, at AFI Catalog of Feature Films. ^ Buried Treasure, at AFI Catalog of Feature Films. ^ Daring Youth, at AFI Catalog of Feature Films. ^ The Shadow of the East at AFI Catalog of Feature Films. ^ Annie Laurie at AFI Catalog of Feature Films. ^ The Acquittal, at AFI Catalog of Feature Films. ^ The Claw, at AFI Catalog of Feature Films. ^ Norman Kerry Filmography at AFI Catalog of Feature Films. ^ Air Eagles at AFI Catalog of Feature Films. ^ Bachelor Apartment at AFI Catalog of Feature Films. ^ Tanks a Million at AFI Catalog of Feature Films. ^ a b c d Los Angeles Times (Los Angeles, California), 3 Nov 1932, page 1. ^ a b Los Angeles Times (Los Angeles, California), 22 Nov 1932, page 22. ^ Fox, Charles Donald. Who's Who On the Screen. New York City: Ross Publishing Co., 1920. Page 120. ^ a b "A Memoir," The Inquirer and Mirror (Nantucket, Massachusetts), April 27, 1918, page 3. ^ Los Angeles Times (Los Angeles, California), 2 Aug 1912, page 22. ^ "Bonnie Glass" at Sonny Watson's StreetSwing.com (accessed 20 Mar 2019). ^ Los Angeles Times (Los Angeles, California), 25 Aug 1926, page 3. ^ Daily News (New York, New York), 29 Aug 1926, page 3. ^ Los Angeles Times (Los Angeles, California), 23 Sep 1917, page 45. ^ San Francisco Examiner (San Francisco, California), 9 Oct 1917, page 7. ^ Lincoln Star (Lincoln, Nebraska), 27 Jan 1918, page 27. ^ New York State Abstracts of World War I Military Service, 1917–1919. Adjutant General's Office. Series B0808. New York State Archives, Albany, New York.Ancestry.com image of record. ^ Los Angeles Times (Los Angeles, California), 1 Jan 1919, page 19. ^ Brooklyn Daily Eagle (Brooklyn, New York), 16 Dec 1917, page 33. ^ Los Angeles Times (Los Angeles, California), 9 Jun 1918, page 45. ^ "United States Census, 1920," database with images, FamilySearch (https://familysearch.org/ark:/61903/1:1:MHQF-GGP). ^ California, County Birth, Marriage, and Death Records, 1849-1980. Ancestry.com image of record. This record, apparently in error, lists the bride's surname as "Guppin." Kerry is listed by his legal name, Norman H. Kaiser. ^ Los Angeles Times (Los Angeles, California), 19 Mar 1920, page 32. ^ Buffalo Times (Buffalo, New York), 24 Oct 1920, page 10. ^ La Crosse Tribune (La Crosse, Wisconsin), 28 Mar 1920, page 14. ^ Los Angeles Times (Los Angeles, California), 30 May 1929, page 22. ^ Los Angeles Times (Los Angeles, California), 8 Jun 1929, page 19. ^ Los Angeles Times (Los Angeles, California), 22 Jun 1929, page 1. ^ Los Angeles Times (Los Angeles, California), 20 Jul 1929, page 15. ^ a b c Daily News (New York, New York), 3 Nov 1932, page 181. ^ Her maiden name is listed in the following birth record for her son by Wells: "California, County Birth and Death Records, 1800-1994," Helen Mary Yost in entry for Frederick Thomas Pearey Wells, 07 Aug 1926; citing Birth, Los Angeles, Los Angeles, California, United States, California State Archives, Sacramento. ^ "New York, New York City Marriage Records, 1829-1940." Norman H. Kaiser and Helen M. Wells, 02 Nov 1932; citing Marriage, Manhattan, New York, New York, United States, New York City Municipal Archives, New York; FHL microfilm 1,684,695. ^ Los Angeles Times (Los Angeles, California), 11 Jan 1933, page 20. ^ a b Indianapolis News (Indianapolis, Indiana), 17 Jan 1933, page 13. ^ Los Angeles Times (Los Angeles, California), 10 Aug 1934, page 29. ^ Los Angeles Times (Los Angeles, California), 18 Sep 1934, page 2. ^ Pittsburgh Post-Gazette (Pittsburgh, Pennsylvania), 8 Jan 1935, page 14. ^ a b c San Francisco Examiner (San Francisco, California), 21 Apr 1940, pages 93, 114. ^ Los Angeles Times (Los Angeles, California), 3 Feb 1938, page 11. ^ Los Angeles Times (Los Angeles, California), 29 Jan 1940, page 9. ^ Los Angeles Times (Los Angeles, California), 30 Jan 1941, page 6. ^ Daily News (New York, New York), 30 Jan 1941, page 166. ^ San Francisco Examiner (San Francisco, California), 1 Feb 1941, page 32. ^ Democrat and Chronicle (Rochester, New York), 20 Jun 1942, page 9. ^ Fresno Bee The Republican (Fresno, California), 13 Dec 1942, page 36. ^ The Times (Munster, Indiana), 4 Nov 1946, page 8. ^ Find A Grave Memorial no. 8009213. Wikimedia Commons has media related to Norman Kerry. This page was last edited on 20 March 2019, at 22:04 (UTC).